If you ever had the urge to peek through a key hole, this would be the perfect opportunity to indulge, especially with a camera handy because you don’t want to miss what’s behind THIS door!On the beautiful Aventine Hill in Rome is the charming Piazza of the Knights of Malta (Piazza dei Cavalieri di Malta) designed by the famous architect Giovanni Battista Piranesi in 1765.A beautifully ornate wall with a wooden door blocks the entrance to the garden of the well protected Priory of the Knights of Malta.The Key Hole on the door of the gives reveals an enchanting vision of the misty cupola (dome) of St Peter’s Basilica, framed by the manicured trees inside the garden just beyond the door. Here is something else amazing to ponder as you peer though the key hole: you are looking through three countries! You are standing on the independent territory of the Sovereign Order of the Knights of Malta, looking through Rome (Italy), and seeing St Peter’s Dome which is inside the Vatican City. 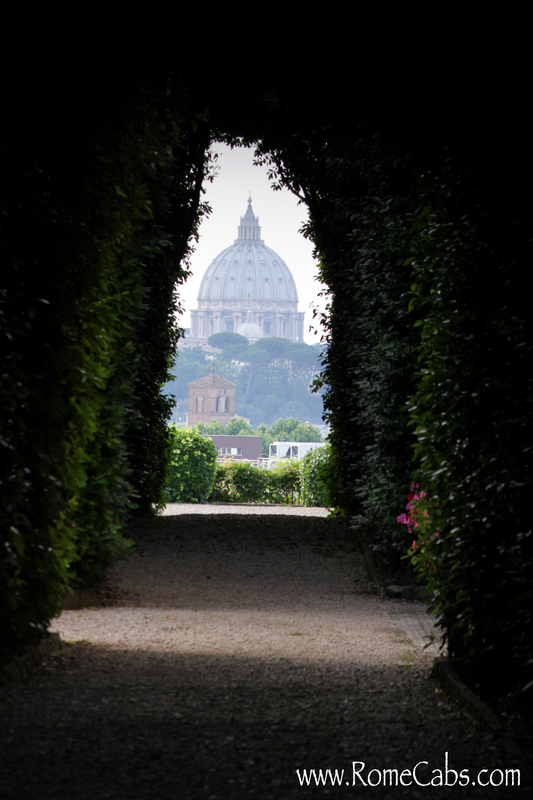 Travel Tip: Be sure to bring your camera and take a photo of St Peter’s Dome through the key hole. Tour Tip: If you are booking a Rome in A Day Tour or Shore Excursion with RomeCabs or Stefano Rome Tours, you may combine a visit to Aventine Hill which in addition to the Key Hole, it includes the famous Orange Garden (Giardino degli Aranci) and the Rose Garden in spring (April and May). For more information on transfers and tours in Rome and beyond, please visit us at www.RomeCabs.com. We look forward to hearing from you! What’s your best kept secret in Rome? We’d love to hear from you in the comments box below. Thank you for stopping by and reading our blog. We look forward to seeing you soon in Italy!